In the turbulence of current events, it’s no wonder that art is being shaken up. That’s good news for a young band like Far Out West, which is finding new musical creativity in the wake of social upheaval. Liz Chibucos of Far Out West on stage with bassist Danny Lee in the background. Courtesy photo. With a new EP ready to share with local music fans, the rootsy funk band based out of Portland, Ore., is all about giving audiences an energetic night of dancing and fun. But their music is inspired by the volatility of the modern era, and their EP “The Good Fight” is all about finding the strength to do the right thing in difficult times. 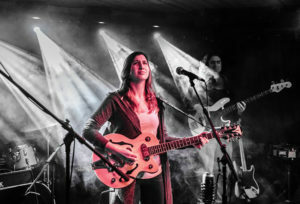 “You get knocked down, but you have to get up the next day and fight the good fight,” said singer and guitarist Liz Chibucos. Having carved out a space in the Portland music scene with their infectious fusion of folk-inspired lyrics with funky, bluesy, jazzy sound, Far Out West is fresh out of the studio with their debut recording. It’s a record shaped by some songs perfected over multiple shows and others written in a surge of inspiration. Chibucos wrote the title track just a week after the presidential election last year. “I was really overwhelmed the first week not just from the outcome but also the feedback people were giving publicly—the kinds of things people were saying from both sides of the spectrum,” she said. The EP came together over three days in a studio. “The Good Fight’s” production was entirely guided by Far Out West with the help of their sound engineer. “Everyone (in the band) is so focused and intentional in how they play, and that really came through in the studio,” said Chibucos. To celebrate the release of their EP, Far Out West is doing a whirlwind tour of Oregon, Washington, Idaho and Montana playing nine shows in 11 days. Having played Sandpoint with a previous band, Chibucos is eager to revisit the town. Catch Far Out West when they play the 219 Lounge, 219 N. First Ave., from 8-11 p.m. Sunday, April 8.